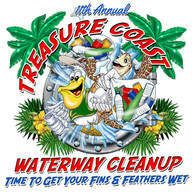 more than 8,500 volunteers and more than 2,500 boats removed more than 77 tons of trash from the waters of the Treasure Coast. This event is for all ages. Perfect for students, service clubs, yacht clubs or anyone who wants to be part of the solution to pollution. All volunteers will receive an event T-shirt and watercraft will receive a commemorative burgee to fly, which indicates that they are part of the event. All volunteers will be invited to an appreciation BBQ in August (date TBA). Register here.